← Friday Humor: Men Be Careful When Dealing With Your Wife’s Age! Most Christians can tell you the value of the incarnation, atonement, or resurrection of Christ. However, on the other hand most Christians would be hard pressed to offer much insight to the practical values related to Christ’s ascension. In this essay Keller explains how Jesus in His ascension provides great value to His subjects as the reigning Prophet, Priest, and King. In between His resurrection and His return to earth – Christ is currently alive and well and currently reigning in the present. Keller discusses what the ascension means for us theologically and practically. Practically, Christ’s ascension means three things: (1) Jesus is available to us now twenty four hours a day, seven days a week for intimate communication and loving fellowship. Keller writes: “Because Christ is ascended we can know his presence, actually speaking to us, actually teaching us, actually pouring out his love out into our hearts–through the Holy Spirit”; (2) Jesus is the Ultimate Sovereign Authority over the universe. Keller explains, “Jesus controls all things for the church, and therefore you can face the world with peace in your heart…To say that Jesus is making everything work together for your good means that not only are bad things a part of his plan but also little things”; (3) The ascension of Christ means that Jesus guarantees that we can know that we are forgiven, accepted and delighted in by God the Father. Keller’s short essay is theologically rich, preeminently encouraging, and extremely practical. This short read will give you an appreciation for the practical ramifications of Jesus’ ascension, but more importantly it will cause you to worship Him on the spot for ascending to Heaven for your benefit and His glory. 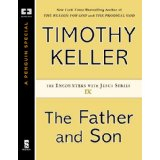 Tags: Ascension of Christ, Book review on The Father and Son by Tim Keller, David P. Craig, The Value of Christ's ascension, Tim Keller's The Father and Son review, What are the practical ramifications of the ascension?